Easy and light summer sides and salads are the way to stay cool and healthy this summer. Here are three for you to whip up for your family - add these healthy sides into your dinner menu often as a delicious way to get those crunchy vegetables into your family's diet! When making these salads, think easy - use already grated carrots, bagged real bacon pieces, etc. It doesn't take but 5 minutes to throw these sides together. Take 1 1/2 cups grated carrots, 1/4 cup craisins, 1/2 cup diced pineapple, and 1/4 cup crushed walnuts to make this beauty! Then keep it sugar-free (the ingredients give it enough sweet crunch!) by stirring 1/2 cup unsweetened soy milk with 1/4 cup mayo (or veganaise) and 1 teaspoon (packet) of Truvia. Yummy sweetness, no added sugar! Mix together 2 cups diced broccoli florets, 1/4 craisins, 1/4 cup real bacon pieces, 1/4 cup diced sweet onion, and 1/4 cup sliced almonds. Take 1/2 cup unsweetened soy milk, 1/4 cup mayo or veganaise, 1 squeezed lemon, and 1 tablespoon honey and stir together to make this lemony sweet sauce. Stir it into the salad mixture. Pleasing to the tastebuds, and body! 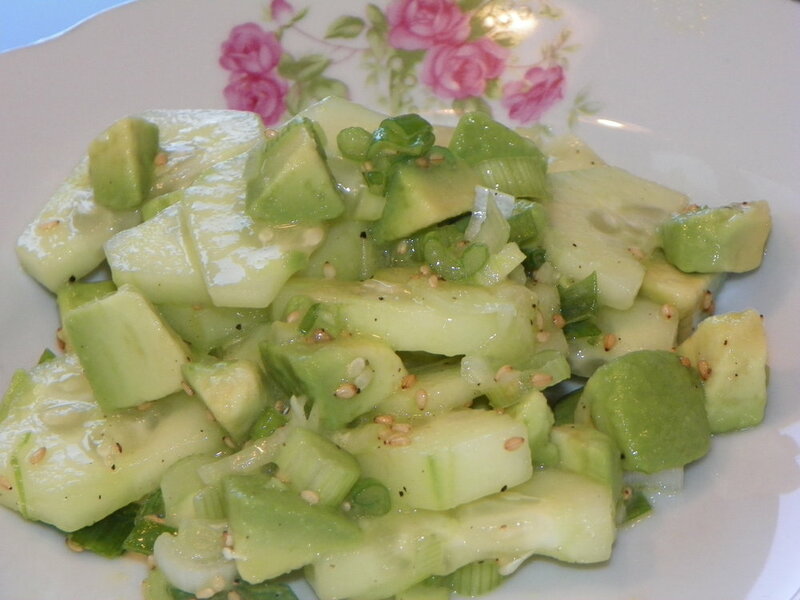 To make this easy side, take 1 1/2 cups cucumber slices (peel the cucumber first), 1/4 cup diced green onion, 1/2 cup diced avocado, and stir together. For marinade, mix 4 tbsp rice vinegar, 2 tbsp canola oil, 1 tsp sesame oil, 2 tsp toasted sesame seeds (these you can buy at the store in a seasoning bottle already toasted!) together and stir into salad. Refrigerate for at least an hour to give the salad better flavor! These 3 salads are perfect paired with fish, chicken or even the occasional beef entree. Enjoy these salads often, as they are easy and so good for you!